The version 1.4 was resubmitted for review to Apple on October 21st, 2010. The code for the GPS device has been rewritten. Please, visit the section "Instructions->GPS" to learn about the changes that we did in the code. A first attempt was made to develop the code to zoom in/out on the map. Pinching the map will zoom in/out and dragging one finger one the map will move the map. The user can choose to use the GPS device or not. If the GPS device is in use, the user will not be able to manually insert points. The GPS device gives the altitude of the position, and the user can choose to use the altitude in the calculation of the perimeter, the distance and the angle. A bug was fixed in the code that draws the map. 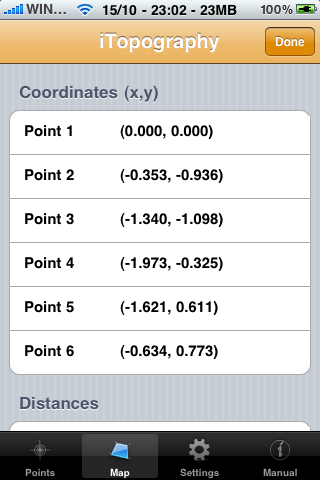 The user can email the data (longitude, latitude and the coordinates of the points). What do you think of the new layout? Now, if you click on the "Edit" button you can reorder the points. Did you notice the three horizontal lines at the right end of each cell? Taping on these lines and dragging the cell to a new position, will change the order of the points. Do not forget to click on the "Done" button for the changes to be in effect. The drawing is a little larger than before. This is because we fixed a bug in the code. As it was requested, all the points are labeled on the drawing. Did you notice the toolbar at the bottom of the screen? If you click on the email button, you will email the data. If instead, you click on the DXF button, you will export the coordinates in DXF format, and you can email this file. Note, that in order to use these two features you must have configured the Mail application. 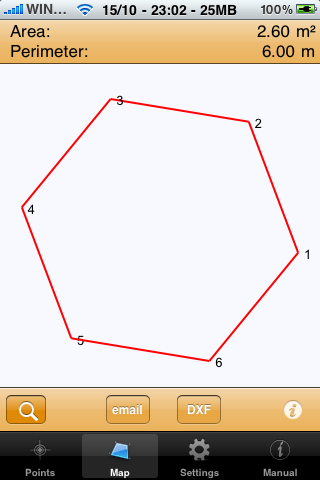 If you click on the icon with the letter "i", besides the length of the sides and the vertices angle, you alse get the coordinates of the points. 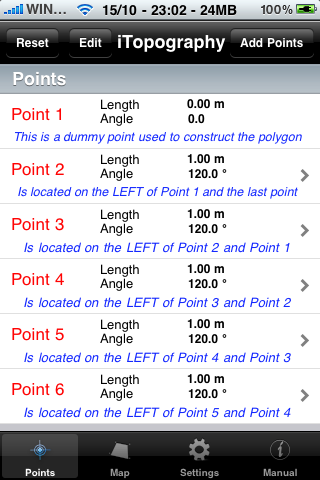 If you click on the search button, the one with the magnifying glass, you can compute the distance between any two points, and the angle between any three points. Note, that in the case of the angle, the second point is the vertex of the angle. 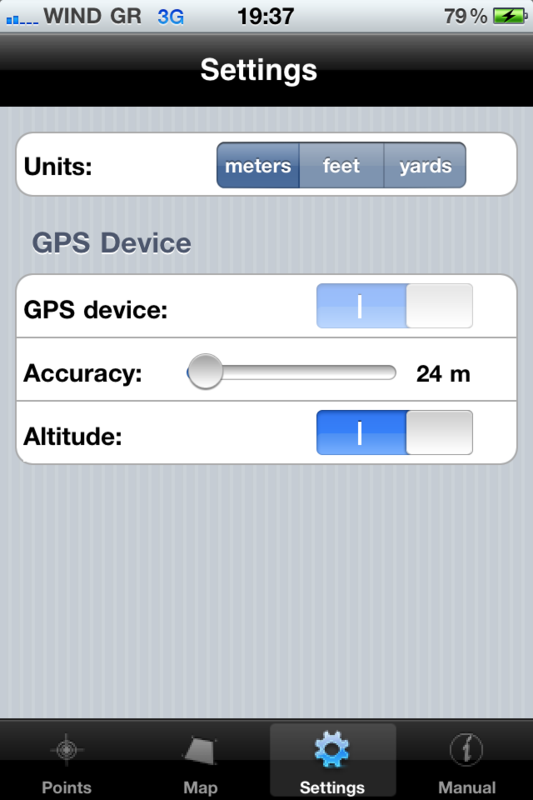 In the settings, you can choose to use the GPS device or not. Starting with this version, the GPS device will also give the altitude of the position. If you prefer, you can use the altitude in the calculation of the perimenter, the distance, and the angles. The altitude is not used in the calculation of the area, but it will soon be. With the current settings, the GPS device is used to find the location of the position, and the altitude is used in the calculation of the distance, and the angles. If you switch off the GPS device, the "Altitude" is disabled. If you switch off the "Altitude", the altitude will not be used in the calculation of the distance, and the angle.